As mentioned in the previous post on this months security bulletin releases, there are confirmed to be 14 security bulletins, addressing 34 vulnerabilities. 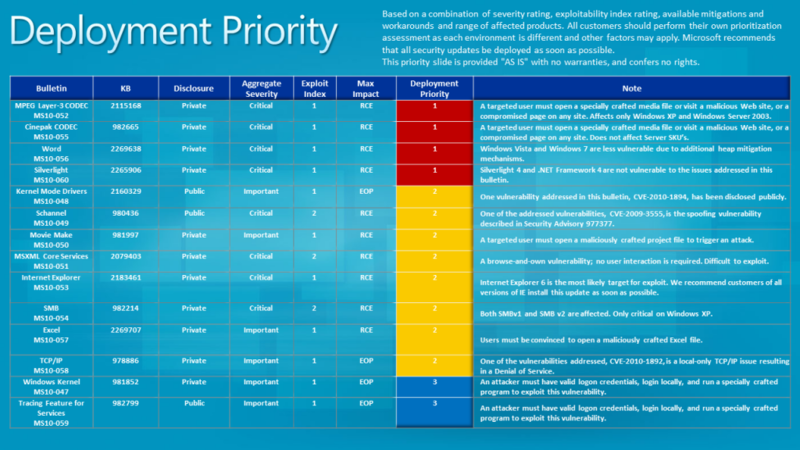 Eight of those bulletins have a Critical severity rating, and four of those are considered to be high-priority deployments. Refer to this page for details on all updates released this month. Of these updates, for the Windows Server operating systems, 3 are listed as requires restart and apply to Windows Server 2003, 2008 & 2008 R2. Since these have been released, limited testing has been undertaken and we can confirm that we are expecting reboots to be required for Windows Server 2003, 2008 and 2008 R2.